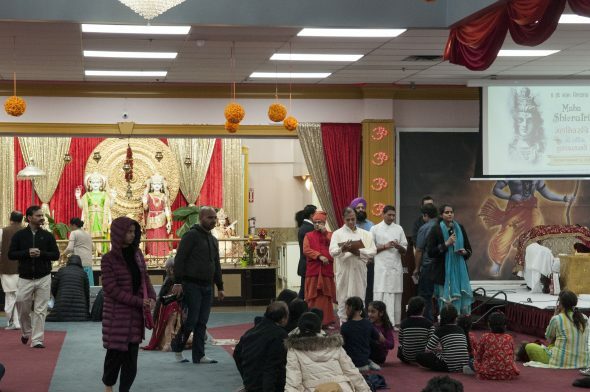 A small congregation of pilgrims walked 16 kilometres through Surrey on Feb. 4, visiting Buddhist, Christian, Muslim, Hindu, and Sikh places of worship as part of the KPU Multi-Faith Centre’s celebration of 2018 UN World Interfaith and Harmony Week. The Surrey Interfaith Pilgrimage, made up of about 20 people of various ages, stopped at six locations throughout the day’s journey. Beginning at 9:30 am, the group departed from Thien Ton Buddhist Temple on 96 Avenue and headed towards Laxmi Narayana Hindu Mandir on 140 Street, where they had a lunch break. At 3:00 pm they attended afternoon prayer at Jamea Muslim Masjid on 124 Street before ending the pilgrimage at 5:00 pm with dinner at Guru Nanak Sikh Gurdwara on 120 Street. Along the way, the pilgrims also made rest stops at Northwood United Church and Canadian Singh Sabha Gurdwara, where they were greeted with snacks, gifts, and a warm welcome from the communities there. At every location they visited, participants in the pilgrimage had the chance to mingle with members of the faith and learn about their systems of belief. “But we can celebrate those differences,” adds co-organizer Connie Waterman. The Interfaith Pilgrimage was first held in 2015 by Vanderleek and Waterman as a response to the Paris terror attacks. The two were able to put the event together in just five days and were joined by approximately 50 other pilgrims. Vanderleek says that the walk intends to show how a community’s different religions offer an opportunity for growth and understanding rather than fear or division. Audrey Hall, a volunteer at Northwood United Church, notes that events which bring different religions together are about more than simply getting to know each other. The Interfaith Pilgrimage was just one of the events held by the Multi-Faith Centre throughout Interfaith Harmony Week. All other events were held at the Richmond campus. Some of these included a pancake breakfast on Feb. 6, another installment of their ongoing “brown bag” lecture and discussion series on Feb. 7, and a performance of Indonesian gamelan featuring master dancer and musician Sutrisno Hartana on Feb. 8.